Featuring fast and easy makeready, the Stitchmaster ST 100 ensures efficient finishing. Operating at up to 9,000 cycles an hour and able to handle formats up to A4+, the robust and easy-to-operate Stitchmaster ST 100 is ideal for on demand finishing. 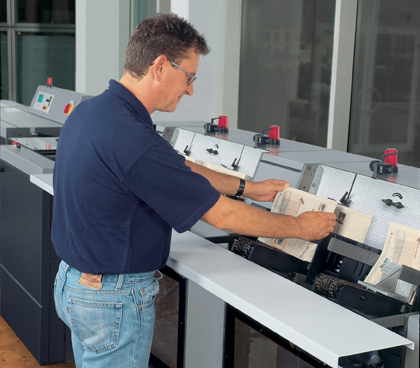 It lets print shops and binderies bring the entire production process in-house. Makeready is facilitated by a menu-driven program. The SPC control system monitors quality and controls all of the saddlestitcher's functions. Job changes are accomplished with just a few simple steps.